The Indiana bat is a small bat that only grows to 3 or 3 ½ inches long and has a wingspan around 10 inches. It is a dark colored bat that has dark gray or brownish-black colored fur with a duller look than the fur of the little brown bat. They have a pinkish colored nose and small hind feet and their fur doesn’t grow past their toes. 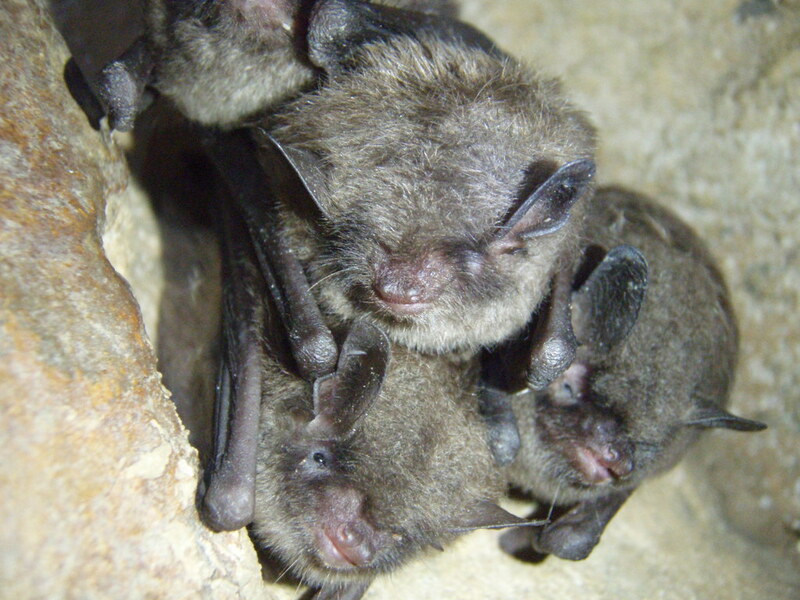 The Indiana bat has a native range that covers much of the eastern United States. It spreads from Oklahoma and Iowa to Vermont and as far south as northwestern Florida. It is widely found across Kentucky and is limited to specific cave areas during the winter for hibernation. In the summer, underneath loose bark is the preferred roosting sites for these bats. Following hibernation, the females will form maternity groups that are located in tree canopy gaps, along forest edges, or in a fence line. Indiana bats need caves that are between 39 and 46 degrees in order to hibernate, thus less than a dozen sites within their home range will host more than 85% of the population for hibernation. They forage for insects, mainly moths, amongst different forested habitats including forest edges and along river and streams. This species of bats is commonly referred to as the “social” bat because they hibernate in large groups and they cluster together tightly. They begin to go into hibernation starting in October, but males tend to be active longer than females until late November. They mate just before hibernation and the females will store sperm until they ovulate in late March and early April. The females will emerge before the males. The females will form maternity colonies of no more than 100 individuals and they prefer areas under loose bark. They give birth to a single pup in late June or early July and the babies are able to fly a month later. Some males do not migrate and will spend summers near their winter roosting sites. Like many animal species across the world, habitat destruction and human expansion are major threats to these already endangered bats. Whether it is the cutting down of the roosting sites or human intrusion into their hibernation caves, people cause much of the issues for these bats. White-nose syndrome has also been found to be an issue for them.